Can you tell me more about sarcasm through the MBTI lens? I tend to interpret sarcasm as a defense mechanism, but you might have some more information about it. 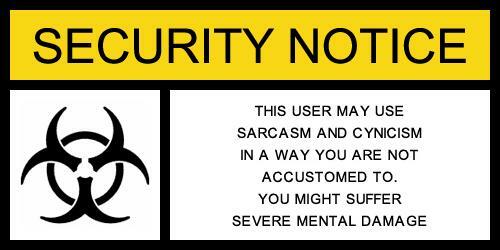 I agree that in most circumstances sarcasm is a defense mechanism. I think it is very important to consider the individual and situation when sarcasm spurts forth. My daughter uses it to goad a confrontation; when I hear sarcasm from her, I know she is trying to divert attention from the real situation. I call it “offensive sarcasm” but it is a form of a defense mechanism – she just believes she maintains the control. She is not an INTJ. I try to flex my personality to meet her needs since I am the adult, the mentoring figure. There may be instances where 2 INTJ’s are discussing a subject and it degenerates into sarcasm and obscure references. That is a good indication that they have realized the discussion has gone beyond the point of absurd and they are now making fun of their own personalities. It is unlikely that someone listening into the conversation would find the humor in the discussion, whereas the INTJ’s will continue to reference the conversation in the future, at odd times, with hysterical laughter, adding layer upon layer of absurdity. Kresser Ran Ragbrai 2013 – Historical Event Complete! We definitely need diplomatic people. I think the older I get, the weaker the “tact” filter between my brain and my mouth. But most of my family is INTJ and the “witty banter” and yes, at times (scorching) sarcasm what what I grew up with. I did an internship with Dept of Homeland Security – representing FEMA at meetings. But the disaster was where I lived. So my boss (total beta) was always mumbling at me “We are Switzerland, we are neutral.” Because I would see the most efficient way to resolve an issue – but it was up to the local and state to make decisions, and I was not there in that capacity. I learned more about politics than I really care to know. FPH – How did I miss this until today?? Yes, “INTROVERTS” has become quite the topic…. And as I type this I see I have a followup blog to write. Agree re wicked puns and word plays. Thanks for adding your input to the INTJ clarification of humor. I never considered it much either, Carrie. I always attributed it to growing up in a large family – we all had the same dry humor, prone to sarcasm. But there are a disproportionate amount of INTJ/INTP females in the bunch vs population distribution. And my son is an INTJ. I have done more reading on MBTI personality types for addressing INTJ/INTP questions on my blog than I previously did for any coursework. I suppose I’m grateful people are interested in that and not asking me about Catholicism – my humor would go from sarcastic to twisted in no time…. Ah yes! Perfect! I also find I use a sarcastic tone when saying the same words dead pan would get me into trouble. For other people, the sarcasm implies its a joke, not to be taken seriously, but I use it to mask the seriousness of the actual words I’m using. A learned few understand my use of sarcasm so their appreciation of the words is much greater. Interesting, Jenna! I “dead pan” with some very obvious “joke” situations and find it unbelievable that what I say is taken seriously.